I think I may have mentioned this before, but my weeknights are awfully busy, what with getting home late, getting dinner on the table, spending some quality tickle time with my daughter and getting her to bed at a reasonable hour. To make life easier, I plan and shop for the week’s meals each Saturday. I sit down with my multiple cookbooks (for inspiration! ), a blank piece of paper, and try to envision what my week will look like. I always factor in one or two nights of incredibly quick meals in case I have to work late, and I try to use up the more perishable meat or produce early in the week. Despite having an army of cookbooks and magazines and blogs at my disposal, I often find myself returning to the same old standbys – stir fries, soups, salads, made with chicken or beef or vegetarian. It’s hard to think outside the box when it comes to weeknight dinners – I want reliable. I want easy. And so I get into a rut. Sometimes a recipe comes along that pulls me right out of that rut and sends me flying. 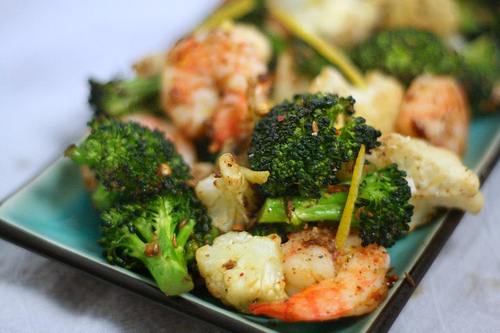 This recipe – roasted shrimp with broccoli – does just that. I would never think to make it on my own. Shrimp seems so decadent for a weeknight, broccoli so time-consuming. I only made it because I noticed a breezy mention by Orangette, and a ringing endorsement by The Wednesday Chef and these ladies were right. You should make this, right now. You see, it’s so much more than shrimp and broccoli. It’s the sweetness of shrimp and the richness of broccoli, brightened by lemon zest which is amplified with coriander and deepened by cumin (have you been cooking with coriander much? You really should. It’s such a lovely summer flavor.) I add cauliflower for its textural contrast, and because the Nuni eats it (she thinks it’s actually flowers), but this can easily be made entirely with broccoli. And it’s so easy, it’s worthy of a weeknight. Especially if you buy the precut broccoli and cauliflower (I do, I admit it, I’m not proud) and frozen shrimp that has been peeled and deveined (unless you happen to live on the Gulf of Mexico, most shrimp you’re going to get has been frozen anyway, so you might as well buy it frozen. Just make sure it’s uncooked). It only dirties one pan (and if you line your cookie sheet with tin foil, not even that!) and it’s good for you — all those cruciferous vegetables. This recipe has become a fixture in my weeknight rotation, a rut of its own, if you will, but that’s OK. Standbys become standbys for a reason, after all. And this is worthy of standby status. Preheat oven to 425 degrees. Lightly crush the spices with a mortar and pestle. In a large bowl, toss broccoli and cauliflower with half the oil, the coriander, the cumin 1 teaspoon salt, ½ teaspoon pepper and chili powder. Spread the vegetables on a cookie sheet lined with foil, and roast for 10 minutes. Meanwhile, combine shrimp, remaining 2 tablespoons oil, lemon zest, remaining ½ teaspoon salt and remaining ½ teaspoon pepper. (You can use the same bowl). When vegetables have been roasting for 10 minutes, add shrimp to baking sheet and toss. Roast, about 10 minutes more until shrimp is opaque. Serve with lemon wedges or another squeeze of lemon juice. Serves 4 people of moderate appetite and 2 greedy people. I love roasting, it makes everything taste better. This looks like a very tasty meal! Looks simple, healthy and delicious. Just the way I like my weeknight meals. Thanks for the recipe! Sounds wonderful…will feature it next week! Here’s my simple tip to making shrimp beyond divine. I tsp each of kosher salt and brown sugar in a bowl w/ 2 c. water and brine the shrimp for a few minutes. The time to prep the spices and veggies should be enough. This makes the shrimp succulent and extra flavorful! This sounds great! I cook broccoli and cauliflower often, but I’ve never used the flavor combo of coriander and cumin with it before. I love whole coriander seeds so much, so I bet it would be awesome! i love roasting veggies, and this recipe is delicious! so simple and so sublime. thanks for posting! A very interesting recipe! You are my friends this weekend special recipe, all of whom are fans of vegetables and shrimp. Made this tonight — thanks for the inspiration! Had to go the lime route with no lemons in the house, but worked well and the 6 year old is now a cauliflower lover 🙂 Thanks for the idea. Beautiful blog, can’t wait to explore more. Will give you a mention in my own post tomorrow. Caitlin this was aaaaamazing!!! I have never liked cauliflower until this recipe. So yummy — thank you for sharing!